Im sure there was another! They were the best for a warm atmosphere & live music, the shabby chic botanical coffee houses of today are nice but i doubt the joy & wildness of the Firkin pubs will ever be matched again! The Flapper on the canal has recently been converted into city apartments i believe, Kleenex moment ?! So pleased to have stumbled across this thread. Its brought back some very happy memories of Friday nights at the Goose & Firkin in the mid-eighties. (Not sure how I’ve got any memories at all after at least half a dozen pints of Dog bolter!). My friends and I were a loyal crew. We used to trek from Holloway Road to Elephant & Castle so we could sing along with Frankie on the piano. I’ve got a cassette with a live recording on somewhere – must dig it out! 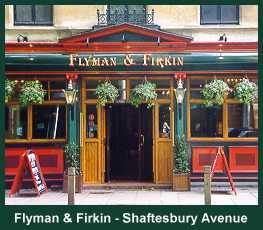 Ieft London in the mid 90s and wasn’t aware of the demise of the Firkin pubs. Such a shame. Used to go to the Flamingo at Beckett St Derby for a pint (or two) of Dogbolter on a Saturday lunchtime after picking up my other half from work. Even lunchtimes were great, brilliant atmosphere & just superb beer ! We moved away to Lincolnshire & I have only just found out about the sad demise of this, & the other pubs. Very happy memories. I too have a tee-shirt – ‘Flamin go & buy me a Firkin pint!’. Sad loss (again) to the grasping ‘big six’ as it used to be. I used to run the Fuzzock & Firkin in Kentish Town, I left the company soon after David sold the company to Midsummer Leisure, I still have the commemorative glass tankard given to the managers, fond memories. I lived in Weyhill while stationed with the USAF at RAF Greenham Common and the wife of a couple (she worked at MOD in London) I met at the Star Inn in Weyhill (now an Indian restaurant) took me to the Goose and Firkin. For years a most prized possession was my Goose t-shirt. I probably had more Brit friends than American and loved every minute I spent in England. When I read these comments from people like me who loved nights out at – in my case mostly – the Goose it makes me mad that such a great place/chain has gone by the wayside at the hands of the Corporates. Then I remind myself that I was privileged to have been part of it whilst it was there and it lives on in my memories. Everything changes – including my memories – I wonder now it is was really as good as I remember… yeah, course it was! David Bruce’s original Firkins were unique. I worked in them just before they were taken over by Allied and the whole philosophy and culture was superb. The Craft Beer revolution years ahead of its time. Corporate management ruined them because the failed to understand this. Most of the Firkins named on here came after the Allied takeover and none of them lived up to the original. I am the landlord of The Lamb in Holloway Road – which 30 or so years ago was The Flounder and Firkin. It’s lovely reading these stories of all the good times in Firkins during the 80s. Any more stories about my one? A while ago I was in contact with Mr Gadd who now runs the Ramsgate Brewery who make a version of Dogbolter – for old time’s sake I want to get that into the pub some time soon. On Thurdays Dave the Keys comes in to play the piano and we have coterie of regulars who sing along. #keepthefaith. Ah, working in Central London in those days… Would sneak off to the Firkin in Tottenham Court Road for some of the legendary Dogbolter. Very sad that the chain succumbed to dark forces. Find memories of the atmosphere, decor and just ‘niceness’ of the Firkin pubs. So reliably good. Stories about the Flounder? Well I used to bash the piano there on Thursdays for about the first four years of its existence in the 80’s. Have you still got the big fish tank round the back? When David Bruce first put it in, he knew nothing about fish and just picked a load of interesting pretty things. He never worked out why some types kept disappearing until we had an all-nighter and saw that the others were eating them. Glad to hear Thursdays still has a piano going! just had another look at my shirts in the loft…then looked on Ebay to see if there were any being sold.. to my amazement there was someone selling two. The Frog and The Goose in used condition. More amazing the said they were very rare and had a price tag of £151 ….EACH! Can anyone put me in contact with, “Mr Gadd who now runs the Ramsgate Brewery who make a version of Dogbolter”? I would love to encourage my local, the Helter Skelter in Frodsham, Cheshire, to feature it as one of its guest beers. The Flounder was one of my favourite sites when I worked with the pubs. I remember some Interesting customers who frequented the pub on a regular basis. Some great characters in the Firkin pubs, I just wished we had those days again. Eddie’s Dog was certainly a great brew and I’m pleased to say his current brew at Ramsgate is an equal. As someone who is visiting after emigrating to NZ many moons ago I sadly found about the demise through a simple search hoping to revisit memory lane. My wife(of the time) and I worked as bar staff for the Bruces chain back in mid 80’s. I have very fond memories of working at the Frog and Firkin in Tavistock Crescent. Every Sunday afternoon, back in the days of “Sunday trading hours” we would fill up a couple of polypins and together with the “locals” head of to Regents or Hyde Park. Can’t recall which now. The afternoon would be spent drinking beer and playing croquet. Then a rush to get back for 7pm opening! Oh happy days. Does anyone remember dancing on the tables to Frankie Boy at the piano in the Goose & Firkin on Friday nights? It was so packed people buy the bat were passed your money and then passed the beer back to you over everyone’s heads…happy happy times! Great memories of a long time ago – it seems like a different lifetime now. I’m a Canuck that spent 7 months working in London and my friends and I loved going to the Frog & Firkin for a few pints of Dogbolter. What a shame that this craft brewery was so ahead of its time. Yes Lesley, I do remember packed Fridays at the Goose, dancing on the tables and general ribaldry. We once met a bunch of other punters at the Goose and for some reason kept singing Alouettes je te plumerai over the pianists music – eventually we were thrown out . . . think the Dogbolter may have got to us. Was disappointed to find on my recent return to the UK that Bruce and his Breweries were only distant memories. Sadly missed, but fondly remembered. I briefly worked as a brewer at the Phoenix and Firkin and the Fox and Firkin, both in south London. Very hard work, it was too! The Allied management had the idea that the chain should appeal to student, and it was placed in their ‘youngs’ division. I believed this to be completely the wrong approach, as students have little money, less knowledge about real ale, and preferred to get their hangovers from the cheap stuff in their students union bar. Interestingly, the Goose had a clock on the ceiling, so you could tell the time lying horizontal on the floor after too many beers! Also, when brewing started there, they uses malt extract, and the fermentation was done in plastic FV’s! I believe that the writing was on the wall when Allied tried to standardise all the recipes countrywide, and I had left before the demise of brewing on site.